This is my life: I’d waited years to finally build my fantasy kitchen, and then I had to live without a kitchen to make the kitchen renovation happen. For most of us, a kitchen renovation means a temporary kitchen in another room in the house. My more fortunate friends had the option of moving out during their kitchen renovation. Others had their entire kitchen (stove, oven, sink with hot and cold water, refrigerator and dishwasher) transplanted to another part of the house. Some others moved their kitchen into an adjacent room and had their plumber put in a sink. And then there was me: squatting by the bathtub washing dishes and trying to keep stray spaghetti strands from going down the drain. But this won’t happen to you, I promise. Setting up your Temporary Kitchen during your kitchen renovation is really not that difficult if you plan ahead (something that we all say we will do, but never find the time). Well, here is your chance. Most kitchen renovators do what I did: move into the dining room or family room and set up camp. Try to find a location that will not be in the line of fire. You don’t want to be in the way of construction traffic, appliance storage or the family television. You also want to be able to sit down and have a meal with your family, even if it is only once a day. Remember, while this is your dream kitchen renovation, ultimately your family will be the ones that will benefit. Remind them of this everyday: If Mama ain’t happy, nobody’s happy. A card table to use as a work space and for appliances, as well as one larger table. The larger table should be as long and as wide as possible because it can also serve as your main dining area. If you have a nice dining room table, try to move it into storage or cover it with one of those table pads made of lightweight fiberboard. These pads protect against spills, moisture, dents and heat. I didn’t move my dining room table and I really regret it. There is a great website – www.tablepadsdirect.com – that will save you hunting all over creation for a pad that fits. It is worth the investment. These pads can also be cut to fit the tops of other pieces of furniture that you may want to protect. And while we are talking about it, remove any carpets, rugs, art work or important pieces of furniture or chairs from the area. This space is now your kitchen. Anything can happen and probably will. 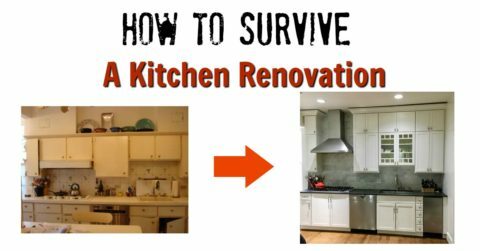 You can also rescue a portion of your old kitchen counter, if it is lightweight enough, and set it up on two sawhorses for a makeshift dining table or workspace during the kitchen renovation. Move your outgoing refrigerator into your Temporary Kitchen during the kitchen renovation, if possible. You will probably lose the ice making and water dispensing elements of the fridge in your temporary workspace. Buy a large plastic bin and scoop that will fit in the freezer section and use store bought bags of ice, or buy ice trays and make your own ice cubes. Ice cube trays were such a novelty to my kids they started making all sorts of frozen treats in them. This was great fun until Mama didn’t have any ice for her martini. When they start ripping out your cabinets, see if you can salvage some of the base cabinets to use underneath the tables for storage. Check the bottom, backs and sides for rough edges so they do not scratch your floor or walls or give your 13 year-old a splinter the size of a small log. You can also use open plastic shelving or easy to assemble steel shelving. Both of these are available at your big box stores like www.samsclub.com or at www.bedbathandbeyond.com. The beauty of these shelves is that they are heavy duty and can be moved to the garage, basement or elsewhere after construction. A Temporary Kitchen should have a few basic appliances. If you don’t already own one of these appliances, with the exception of a microwave, don’t buy a new one, borrow a friend’s. If you don’t own a microwave, but will be putting one into your new kitchen, see if you can have it delivered early so that you will be able to use it in your temporary kitchen (unless it is going to be installed). I would not buy a used microwave because you don’t know if someone used it to dry their poodle. Maybe it’s just me, I don’t know. If you use your microwave to reheat coffee or make popcorn, you will be surprised at what you can do with this oven. Keep your old microwave oven if you are getting a new one. Make sure it is on a good sturdy surface because you will use this appliance more than ever before. Even if you don’t drink coffee, you need one of these. Make coffee every morning for your construction workers and you will quickly build a great rapport. The Electric Wok is surprisingly versatile and moves beyond just stir fry. It is similar to an electric skillet because you can easily roast meat, make fondue, or deep fry. An electric wok is also great for making scrambled eggs and, of course, frozen Chinese pot stickers, dumplings and noodles. If you haven’t used one of these since college, or only use it now for toast and nachos, you’ll really be pleased at how many meals you can make. While you won’t be able to roast a whole chicken or rump roast, if your toaster oven is one of the newer models, you’ll be able to bake chicken pieces and chops. You’ll also be able to make smaller cobblers and pies. Because of it’s small size like the microwave, the downside is you often have to cook in batches. That’s okay. Feed the kids first and have a cocktail with your husband while you wait for your dinner. Date night! I didn’t use a hot plate because I figured out how to do almost everything with the other appliances. But if you have a lot of pasta eaters or want hot boiled eggs, then I recommend getting a small one-burner hot plate. Every time I buy a rotisserie chicken I silently thank the Party Gods. This is one convenience food that is almost always delicious, no matter where you buy it. The National Chicken Council says that Americans buy more than 800 million chickens a year. We also buy almost as many rotisserie chickens as whole raw chickens. Wow. I like these birds because they are high in protein and, if you take the skin off, low in calories and fat. While you are doing your kitchen renovation, you will be eating a lot of rotisserie chicken because you can use it in amazingly different ways. You won’t get sick of eating it until just a few weeks before your renovation is finished (and you won’t want to eat it for many, many months). Rotisserie Chickens come in a lot of different flavors, like Barbecue, Teriyaki and Herb. Those flavors lightly scent the meat, so if you have a choice, try to find a plain roasted chicken. Some stores roast their chickens without the skin. This tends to make the birds drier, but somewhat healthier because it is not cooked in the fat. If you don’t want to remove the skin yourself, look for skinless rotisserie chickens. Check the time the chicken came out of the oven or how long it is has been under the lights or in the store’s oven box. The time is usually marked somewhere on the package, but if you can’t find it, ask. Choose the larger, big breasted chickens. I don’t know why, but the big-box stores, like Costco and Sam’s Club seem to have larger chickens. This means they have more meat and are less likely to be dry. Yes, yes, I know, those birds were probably fed growth hormones and who-knows-what-else. You decide. Try to prepare and eat the chicken as soon as possible. Separating the meat from the bone is easier when the chicken is still warm. You will need a resealable plastic bag or plastic storage container with a tight fitting lid nearby to store the meat after it has been carved. Remove the plastic lid covering the chicken and turn the lid upside down so it is like a bowl. This will keep your workspace cleaner and minimize the number of dirty dishes. Unless you are serving it as it as a roasted chicken, remove all of the skin from the chicken. 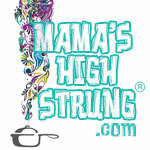 Place it in your “lid bowl (see above).” Pull the leg and thigh back at the joint and pull it away from the body. These chickens cook so long in the rotisserie oven, that this is pretty easy. If you can’t just snap it off, use a sharp knife to cut through the thigh socket. Repeat on the other side and place the meat in the plastic bag or storage container. Twist the wings off the carcass, or use the knife if they are a stubborn, and place them in the bag or container. To remove the breast, use a sharp knife to cut deeply along either side of the breast bone. Pull the breast meat off with your hands. Store as previously directed. You can keep the chicken in the larger pieces or remove it from the bone, shred it and store it. I like to keep it in the large pieces because some recipes call for shredded and others ask for cubed or sliced chicken. Store the chicken in the resealable plastic bag or plastic storage container in the refrigerator. Store-cooked rotisserie chicken usually yields 4 cups of white meat and 2 cups of dark. The dark tends to be more flavorful and moist and the white can be drier, but use whichever you prefer. I like to use the white meat when presentation is important. Don’t lose sight of the importance of making your dishes taste and look delicious, even if you are serving them on paper plates. Try to use the chicken within 4 days. If you are creeping up to the 4th day, make a simple chicken salad with mayonnaise and stuff it in a hollowed out tomato or avocado. Another idea is to top tortilla chips with the chicken, a little cheese and some jarred jalapenos and microwave it until the cheese melts. This is a quick lunch or dinner, and if anyone complains, make them do the dishes. Don’t worry, I didn’t forget that you still have dirty dishes to clean up! I strongly suggest that you put on your Environmental Blinders and use every disposable kitchen item available. Paper plates, paper napkins, plastic forks and cups will make your life so much easier. I’ll admit that there are some things you just can’t cut with a plastic knife and fork, so make sure you keep some real tableware handy (along with your kitchen knives, spoons, spatualas and a whisk (or any other tool that you use a lot). When it’s time to wash the dishes, you may have to wash them in the bathtub to get them clean. I know that sounds a little gross, but most bathroom sinks aren’t large enough and can easily be damaged by a metal pot. Make sure the tub has an extra-fine screen so bits of parsley don’t clog up the drain. I will confess that once or twice I took a platter outside and hosed it down in the garden. Don’t judge. You do you and I’ll do me. Have a designated “dirty dishes” plastic bin and an extra bin for rinsing the dishes. You’ll also need a drying rack if you don’t have someone to help dry the dishes as you wash (that’s what kids are for, by the way). When it’s time to wash the dishes, thoroughly wipe or scrape out the dish or pot with paper towels. Carry the dishes in the bin to the bathtub. Channel your ancient relatives and crouch down by the tub and wash the dishes, like you’re washing by a stream. With my youngest girls, it became a game and saved my back a few dozen times. Dry the dishes and carry them back to your Temporary Kitchen. You don’t want platters and forks in your bathroom any longer than they have to be! So now you’re ready to set up your Temporary Kitchen, feed your family and keep the whole process (somewhat) sanitary. Just remember! Organization is key… along with a couple of bottles of wine!